I really need someone now, but I can’t take off from work. What do I do? Petri offers our customers evening and weekend hours for your convenience. If you have an emergency plumbing problem, do not hesitate to call us at 718-748-1254 for immediate assistance. Do you offer 24-hour emergency service? Yes, we are available 24-7 to help you with any plumbing or heating emergencies. No, only our highly trained, trusted technician’s deal with our valued customers. We provide plumbing and heating service in all areas of Brooklyn, including Cobble Hill, Dyker Heights, Bay Ridge, Park Slope and Brooklyn Heights, NYC. A real plumber in NYC with evening and weekend hours? How much does that cost? No matter what time you need us, along with our normal minimal service charge, we will dispatch a technician to your house day or night at no extra cost to you. We realize that no one plans emergencies. We would be happy to help, even on Sunday! Ok, you convinced me, how soon can you arrive? Usually we send our technician to your home the same day and providing you with a 2-hour window. Certain emergency situations have immediate priority. Please call 718-748-1254 for availability. How will I know when exactly the technician will arrive? Our customer service representative will provide you with the 2 hour window and with a call back to let you know that the technician is on his way and will supply the technician’s name for your safety. Supposed I am not satisfied with the service provided? In the unlikelihood that you are not 100% satisfied with the service provided, you should call our customer service representative at 718-748-1254 and inform us. We will attempt to satisfy you until we get it right or YOU WILL NOT PAY. Do you warranty plumbing repairs and replacement parts? Yes, all repairs are 100% guarantee or Petri will redo the repair for free. All parts come with a manufacturer warranty and for Petri Total Care Club customers there is an extended warranty. Call 718-748-1254 for more information. My hot water heater is leaking, how do I turn it off? A shut off valve should be located at the top right hand side of the inlet to the water heater. 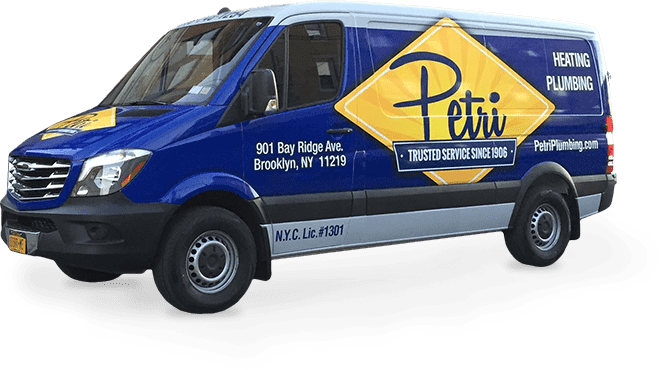 Call Petri for service at 718-748-1254. I hear running water throughout house. What should I do? A main shut off valve should be located at the front of the house by water meter. Close immediately and call 718-748-1254 for further assistance. I don’t know where any valves are located in my house. What should I do? Call us at 718-748-1254 immediately for our FREE emergency valve tagging service. I keep running out of hot water, should I install a larger hot water heater? There are as many ways to heat hot water as there are reasons why you may be running out of hot water. 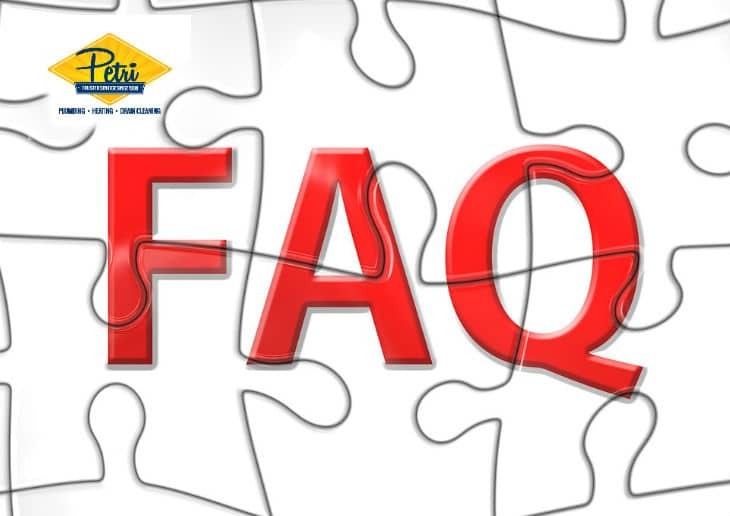 Before installing a larger heater, let Petri Plumbing & Heating, Inc.’s technician analyze your water usage and inform you of the options available. At times my drinking water looks milky and has a funny odor. What can I do about it? Bubbles of air trapped in the water can make it appear cloudy and milky. It is only temporary until it settles. The smell is from the chlorine NYC uses as a disinfectant to kill the germs. Filling a pitcher and letting it stand in a refrigerator overnight will eliminate the odor. Should I by bottle water to drink in NYC? All NYC drinking water meets all Federal & State health based drinking water standards. Bottle water cost 1,000 times more per year than tap water. If you are still not convinced call Petri Plumbing & Heating, Inc. and we will install a state of the art water filtration system custom designed for your home. I have never had to call a plumber before, let alone Petri Plumbing & Heating, Inc. What should I expect? Petri is serious about customer service and safety. We background check every employee to ensure we have the best person in your home. Your first interaction with our company will be a friendly voice and one of our professional customer service people will be eager to assist you in setting up an appointment. Our technicians will call you before heading to your home to ensure your safety. Why are you different? Why are you better? We will not quit until your problem is completely solved and you are 110% satisfied. That’s a promise. Have additional questions for your Brooklyn Plumber? Call us today at 718-748-1254. We are confident you will notice our professional, friendly, and eco-conscious approach to plumbing and heating.